A-locus rabbit colors. 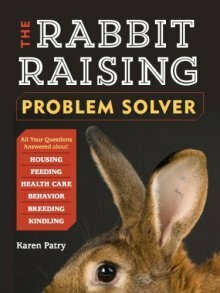 Breed rabbits smartly by understanding rabbit coat color genetics pertaining to the 2 A-locus color genes carried by domestic rabbits. 'A' stands for 'Agouti,' meaning, the agouti pattern on a rabbit's hair shaft. 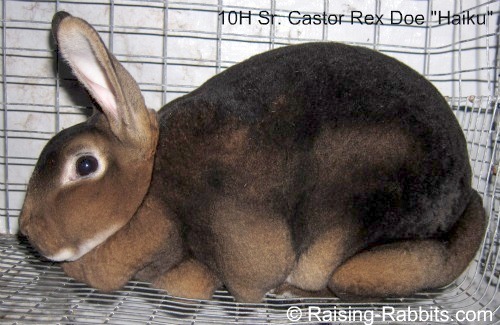 The possible genes of the the A-locus color series are ‘A,’ 'at,’ or ‘a.’ These determine the pattern of the hair shaft, without influencing the actual rabbit color. Agouti rabbits come in many colors, but the one thing that makes them agouti is the banding on the hair shafts. In addition to the bands, the agouti gene (A) also results in a white or ivory belly with a base color of slate-blue or dove-gray ring under the white fur. White. At the bottom of the hair shaft nearest the skin, you'll find a very narrow ring of white, if the rabbit is in a prime coat. This ring is only present when the coat is in full condition, and is not often mentioned, except in connection with conditioning or with recognizing a prime rabbit pelt. Slate-blue. Meaning, gray. The 'undercoat' is bluish gray, and should constitute roughly 1/2 of the hair shaft. Rufus. The middle ring is a rich band of rufus red, also described as "orange," "well-defined orange," or "rich rufus red" in the various ARBA breed Standards of Perfection. Black. The hair shaft is tipped with a sliver of black. The overall effect of the rufus red glistening through the black tipping is one of mahogany or chestnut brown. The 'A' gene is completely dominant. No matter what the second gene is at the A-locus, an 'A' will override all the effects of the other gene. 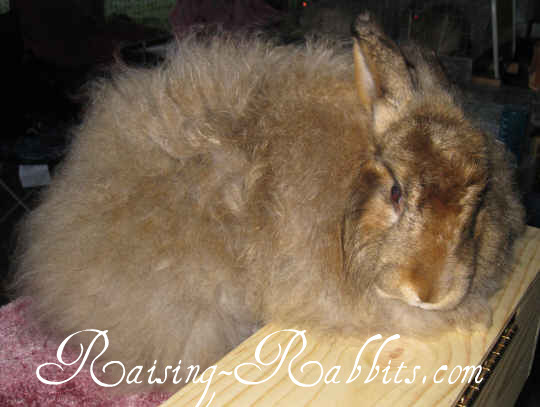 This is what chestnut agouti coloration looks like in a Satin Angora rabbit. Black agoutis: Chestnut, copper, castor, sandy, gray - all names used by various breeds to describe their black-based "A_B_" agouti rabbits. Chocolate Agoutis: Chestnut Chocolate, cinnamon (the color, not the breed), amber - all names used by various breeds to describe their "A_b_" chocolate agouti rabbits. Dilute blue agoutis: Opal (blue-based), lynx (lilac-based) - names describing "A_dd" agouti rabbits with the dilute ‘d’ added. 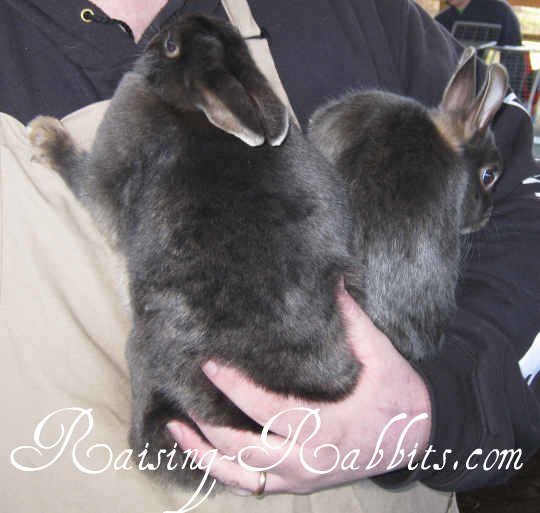 The rabbits pictured are opal mini-satins. The depth of the opal color is enriched by the satin gene. Chinchilla-factored and shaded agoutis: Chinchilla (black), squirrel (blue), chocolate chinchilla, lilac chinchilla, beige, sable chinchilla, smoke pearl chinchilla, light gray, steel gray - colors describing the 'A' locus combining with the B and C genes. Non-extension agoutis: Cream, fawn, red - what you get when you mix the agouti 'A' with the ‘ee’ non-extension genes. This is tricky, because the non-extension ('ee') seems to erase the agouti banding. Though at first sight they might look like selfs ('aa'), nevertheless a few clues to their 'agouti-hood' remain. For example, creams and fawns have white bellies to the skin, with no gray undercolor. More shaded agoutis: Sable Point, Blue Point, Smoke Pearl Point, Chocolate Point, Lilac Point, Seal, Siamese Sable, Siamese Smoke Pearl, Blue Seal (Dark Smoke Pearl), Frosted Pearl/Frosty, Pearl, Ermine - colors formed by adding various ‘c’ shading genes. Over time, two additional A-locus rabbit color mutations have occurred, resulting in a total of 3 options at the A-Locus for rabbit colors. Each of these mutations affects pattern, not color. The distinctive tan pattern produces a solid color over the back and the sides. Where the top color meets the belly color is a narrow band the color of the intermediate ring, if the animal still had one (it doesn't). A tan pattern also gives intermediate ring coloration in the ears, the neck triangle, and intermingled coloration on the chest and dewlap. Plus, tans and otters should have intermediate-colored ticking near the junction of top and belly colors. Tan rabbits (the breed) have fiery red bellies, compliments of the recessive 'ww' wide band recessive gene combination. Ticking is not found in Tan rabbits. Tan pattern 'at' is recessive to Agouti, but dominant to selfs (‘a’). A ‘tan pattern’ rabbit carries at least one ‘at.’ The second gene of the A-locus could be either 'at' or ‘a,’ but not 'A' (agouti). Why not 'A'? Because 'A' is completely dominant. If the rabbit carried an ‘A’ with its ‘at,’ the rabbit would be an agouti, as above. Tans (black, blue, chocolate, lilac). Otters and tans are very similar, however tans also carry modifying factors that redden the belly color. Martins (silver martins, sable and smoke pearl martins). Martins carry the at pattern gene plus one of the chinchilla factor ‘c’ genes, which eliminate the yellow color, replacing it with white. 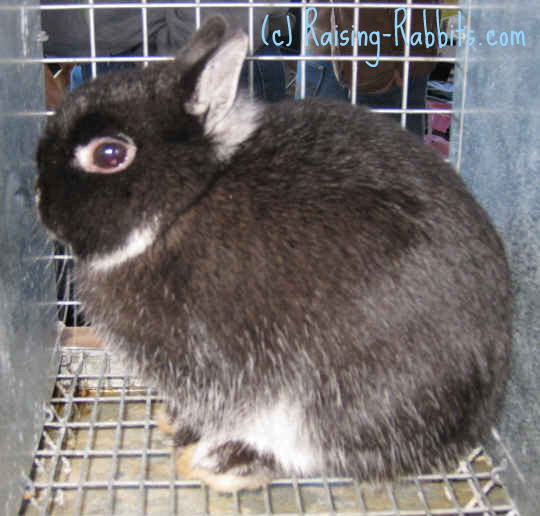 The rabbit pictured here is a black martin Netherland Dwarf. His coloration is black, along with silvery white. You can see the white in its ears, neck triangle, belly, and the eye ring. The 'self' mutation removes all banding whatsoever, leaving a rabbit with one color all over, top to bottom. Self is recessive to both tan 'at' and agouti 'A.' Therefore, a self rabbit must carry ‘aa’ at the A locus. Selfs are black, blue, chocolate, or lilac, depending on the actions of the B, C, D, and E genes. 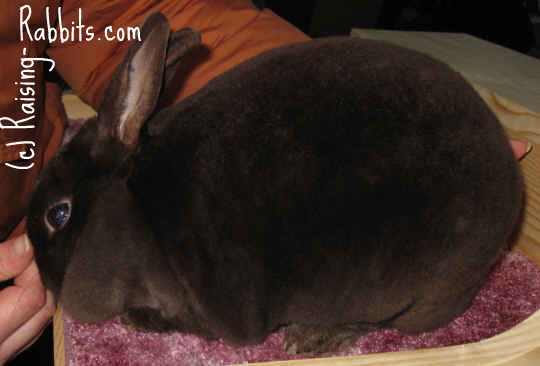 The rabbit pictured is a chocolate (self) Mini Rex Rabbit. He is chocolate-colored all over, including the belly, neck triangle and inside the ears.